The Amidons are equally at home doing a concert of stories and songs for adults or children, calling a community dance for all ages, or leading harmony singing workshops with adults. 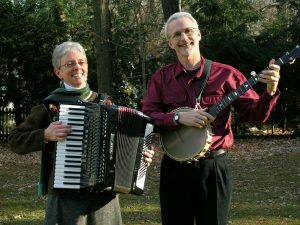 Peter and Mary Alice are familiar faces at the major northeast U.S. music and dance festivals, at teacher conferences, and at summer folk camps of traditional dance and song. 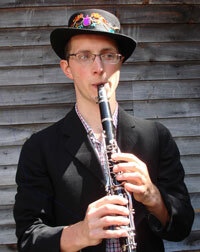 They have performed concerts and led residencies in hundreds of schools, libraries and churches. Choirs and choruses throughout the United States and the UK are singing the Amidons’ choral arrangements. Thousands of teachers and parents have shared the Amidons’ music through their albums of songs for all ages. And thousands of educators and community dance leaders have led children and adults in traditional American and English dances and singing games gleaned from the books and recordings produced by New England Dancing Masters Productions: Peter and Mary Alice Amidon, Andy Davis and Mary Cay Brass. Peter is founder and former director of Brattleboro Music Center Children’s Choir, a choir director at the Guilford Community Church, and co-director of Hallowell, an a cappella hospice choir. He led Sacred Harp singing at the Old Songs Festival for the over twenty years, and was handpicked by Pete Seeger to run the Circle of Song, a participatory singing stage at the Great Hudson River Clearwater Revival Music Festival, for four years. His choral arrangements, published in the two collections “Fifty-five Anthems for the Small Church Choir” and “Twenty-five Anthems for Interfaith & Community Choirs” are being sung by choruses throughout the US and the UK. 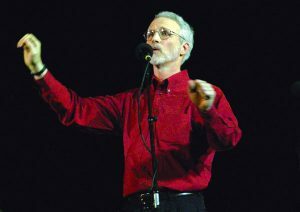 He has been the featured storyteller, contra dance caller, and harmony singing leader at several of the Country Dance and Song Society of America‘s summer camps of traditional dance and song. Mary Alice is an annual favorite in many elementary schools for her music, storytelling and dance concerts and residencies with K-4 students. She presents teacher workshops by herself and with Peter Amidon across the country. 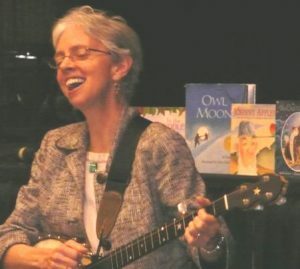 Her two solo albums of songs for children: ‘Teaching Kindergarten’ and ‘Songs for a Singing Family’ are two of the most popular CD’s from the Amidon collection. Mary Alice just released her first ‘solo’ album for adults: Keys to the Kingdom. Produced by son Sam Amidon and including the playing by many in the stellar network of Mary Alice’s music friends, her new album includes songs old and new, and quite a few Mary Alice originals. She leads harmony singing at Adult Village Harmony and Country Dance and Song Society summer camps. She is one of twenty-five composers commissioned to compose an original choral piece (‘Sweet is the Day’) for the Social Band’s “Vermont Composer’s Project” and contributed several compositions and choral arrangements to the Amidons’ two choral collections “Fifty-five Anthems for the Small Church Choir” and “Twenty-five Anthems for Interfaith & Community Choirs“. Mary Alice has a particular gift for enhancing picture books with music, song, storytelling and movement. Based in Los Angeles,Sam Amidon is a critically acclaimed (“…his highly personal approach opens a window on the American past and lets us feel it like nothing else around.” – All Things Considered, NPR) singer, instrumentalist and recording artist. He has released five albums of his re-interpretations of traditional American folk songs (Lily-o is…““a hauntingly beautiful new album…” -New York Times) collaborating in the studio and onstage with a wide range of musicians including Bill Frisell, Thomas Bartlett, Nico Muhly, Chris Vatalaro, Shahzad Ismaily, the Kronos Quartet and more. 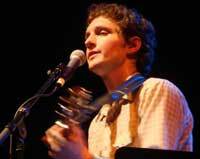 He has performed throughout the United States, Canada, the UK, Ireland, Western Europe and Australia. Sam plays fiddle, banjo and guitar. He is married to British singer/songwriter Beth Orton who just released her first album in six years “Sugaring Season” to world-wide critical acclaim. Beth has a daughter Nancy; Sam and Beth have a son, Arthur. Stefan lives in Brattleboro, Vermont with his wife Zara Bode and their son Desmond. He graduated from Oberlin College as a jazz percussion major. Stefan is percussionist, singer and founding member of the Sweetback Sisters, a “honky tonk band for the modern cowboy and girl”, featuring lead singers Zara Bode and Emily Miller (The Sweetback Sisters have appeared on Prairie Home Companion, coming in second in Garrison Keillor’s national “Twenty-somethings Bands” competition); a founding member and bass singer in Starry Mountain Singers a cappella ensemble (which also includes Zara Bode), and, in 2015, became the percussionist for The Devil Makes Three. Stefan, a gifted singer and singing leader, leads shape note singing at the Old Songs Festival, and has led harmony singing at Oberlin and at the CDSS-sponsored summer camps Pinewoods Family Week and Ogontz Family Week. He has been on several Northern Harmony tours, and was a leader of an Adult Village Harmony singing camp. Although he is best known as a percussionist and singer, he is also becoming a hot mandolin player, and a deeply meditative old time fiddler. Stefan has been the percussionist of choice for several of America’s favorite contra dance bands, including Assembly (AKA Popcorn Behavior), Magic Foot , Lissa Schneckenburger and Lift Ticket.